Specially formulated to eliminate all known germs, our Gompels Professional Bleach is supplied in a handy double pack. 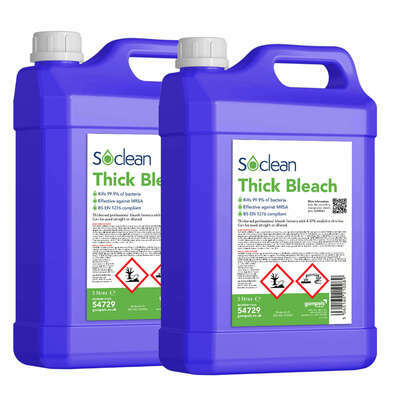 The thickened bleach is a professional and viscous mixture of sodium hypochlorite with added surfactants. Providing high levels of disinfection, it clings to the surface to prevent the future build-up of germs. Used in care homes and hospitals, it can effectively remove stains and eliminate unpleasant smells caused by waste and refuse. The large 5 litre bottles provide an economic option with an easy-to-pour container design and secure screw down lid. Kills 99.9999% of all known bacteria, fungi, spores and viruses including C.Difficile, MRSA Hepatitis B. Please note, rubber gloves, aprons and eye protection should be worn when handling this concentrate.